If you haven't been over to Scraptastic Club's site in the past week or so, you may not have noticed that they now have a Store!!! 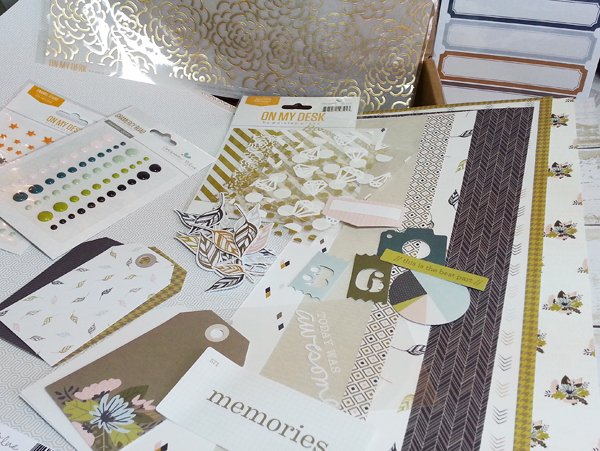 I got some awesome new goodies and I just finished 2 layouts using the some of the gorgeous new Gossamer Blue products. Today I thought I would share my love for using patterned papers as backgrounds for my layouts. The key is to keep it light or to be sure you have good contrast to show off your photos. For both of my pages I used mostly the "Gramercy Road" collection. I love the very nice detailed papers that have great colors, but over all they read as lighter more neutral tones and they don't overwhelm the photos. There are several papers in this collection that make great background papers. For my first layout I chose a lighter blue/grey pattern for the background and it has just enough of a pattern to keep the layout from looking as flat as it would with a solid paper. The light papers kept the page from becoming too busy because my photos are already busy and dark. I also used one of the darker patterned papers to have nice contrast for my title. I used some old twine that I bought when I was antiquing to tie a double bow on the tag and then added a few of the die cut leaves to the ends. I have to point out the 3/4 transparency card from the "On My Desk" collection that I used behind my die cut tag, these cards are the perfect touch when your layout needs that extra something. For my second layout I used a light wood grain paper from the Sweater Weather collection by Simple Stories and I may need 10 more sheets of this one! I wanted a more out door look for my safari photos. I thought it would be a great way to lighten up my animal photos. Often times, zoo or outdoor layouts are darker colors and the photos aren't the focus. The package of tags and the package of die cut leaves helped me put together a very coordinated page in less time then my pages normally take. I added some white sequins to the leaves and straight stitched for a dimensional border.